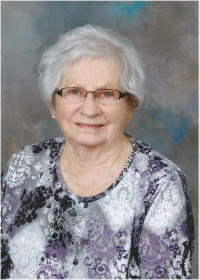 Irene Diane (nee Rondeau) Sobering, age 96, peacefully passed away on Thursday, April 11, 2019 at the Bethesda Regional Health Centre in Steinbach, MB. Mom will be sadly missed by her daughter Diane (Brian) Mackay of Abbotsford, B.C. and son Don (Erna) Sobering of Steinbach, MB; grandchildren David, Corey, Kristine and Tannis; two great-grandchildren, Landon (Rachel) and Justin; and one great-great-grandchild, Maela. She was predeceased by her husband Ben Sobering (2011); one infant son David; her parents, two sisters and five brothers. Irene was born to Thomas and Clarisse Rondeau on October 20, 1922 in Price, Matane, Quebec, Canada. She was raised in St. Boniface, Winnipeg, MB until her family moved to a small acreage in the Rural Municipality of LaBroquerie, MB where she met her prince charming, Ben Sobering. They were married on September 12, 1942. After their marriage they resided in Steinbach, MB. Mom was devoted to her husband of 69 years and to her children. Her wonderful creative abilities were evident in cooking, gardening, needlework pictures and blankets she made for her family. She also was an active church member at the St. Paul’s Evangelical Lutheran Church of Steinbach, MB for many years and became a Life Member (Ladies’ Auxiliary) of The Royal Canadian Legion. Mom cherished all the visits with relatives and friends. A Memorial Service will be held on Wednesday, April 17 at 2:00 pm at the St. Paul’s Evangelical Lutheran Church, 465 Henry Street, Steinbach MB. A private family interment has taken place. The family would like to express their appreciation to the staff at Bethesda Place for the excellent care and compassion given to our mother and her family during this difficult time. In lieu of flowers, donations may be made to the Bethesda Foundation or St. Paul’s Evangelical Lutheran Church (Building Expansion Fund). to Diane and Don and families, my condolences on the death of you mother, she was a wonderful lady. To Don & Erna in the loss of your mother. I would often see & talk to her when having coffee with my aunt. My condolences on the passing of your mother. She was a great lady! My condolences to Don and Erna on the passing of your mother. May your memories consul you at this difficult time. My deepest sympathies to your whole family. I remember your Mom (and Dad) very fondly. I know you will have so many wonderful memories. Her love will be with you forever.